﻿ Oahu Health Guide - The 5 R's - Reduce, Reuse, Recycle, Recover, and Rethink! Contact Hawaii Health Guide for Advertising Rates & Info. Oahu Health Talk The 5 R's - Reduce, Reuse, Recycle, Recover, and Rethink! The 5 R's - Reduce, Reuse, Recycle, Recover, and Rethink! Recycle Hawai`i is a 501(c)3 non-profit educational organization serving Hawai`i Island. 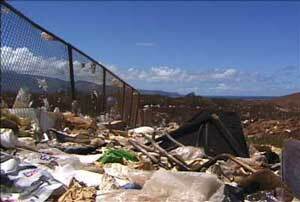 The mission of Recycle Hawai`i is to promote resource awareness and recycling on the Island of Hawai'i. Hawaii’s new bottle law is not only helping to reduce trash in our landfills and litter on our beaches, but it’s being put to work to raise funds for those in need. Garbage gone but not forgotten! Did you know that Americans discard enough aluminum to rebuild our entire commercial air fleet every 3 months? Did you know that most bottles and jars contain at least 25% recycled glass. Glass never wears out and it can be recycled forever. Did you knowt that a quart of motor oil can pollute 250,000 gallons of water? Did you know that Americans throw away the equivalent of more than 30 million trees in newsprint each year? Did you know If you lined up all the polystyrene foam cups made in just one day, they would circle the earth? Did you know that Oahu generates approximately 1.5 million tons of waste annually from residential, commercial and industrial sources. Most of our garbage is sent to landfills, dumps or municipal incinerators. But with more and more people producing more and more waste, landfills are filling up faster than we can find new sites for them. And landfills create new types of waste. As garbage decomposes, moisture filters through it producing a toxic liquid known as leachate. Modern landfills are designed to reduce the amount of moisture that reaches the garbage, and many have a system to collect and treat the leachate. Decomposing garbage also produces two greenhouses gases: carbon dioxide and methane, an invisible, odorless, and highly flammable gas. At some big landfill sites in, methane is now being collected and burned to produce energy. Water and oxygen are required to break down garbage. But water and oxygen are in short supply deep in a landfill, so decomposition takes place very slowly. In fact, when researchers cored down into a landfill in the United States, they discovered newspapers over 30 years old still in readable condition! Incinerations are sometimes used to burn solid waste under controlled condition. They reduce the stress on landfills, but they create other environmental problems. The ashes must be disposed of, either at a landfill, or, if they are toxic, at a hazardous waste facility. Burning garbage also produces acid gases, carbon dioxide and toxic chemicals that must be treated with expensive air pollution control equipment to avoid contributing to acid rain, ozone depletion and air pollution. On Oahu, H-POWER began operation in 1990 and today converts more than 2,000 tons of waste per day into electricity to power more than 60,000 homes. H-POWER is the cornerstone of Honolulu's integrated waste management system. H-POWER produces 7% of Oahu electricity and reduces the volume of refuse going to landfill by 90%. On Oahu, waste-to-energy works in partnership with recycling efforts to significantly reduce the amount of waste going to landfills. In addition to reducing the volume of waste entering the plant by 90% through incineration, H-POWER is actively engaged in recycling. Virtually 100% of the ferrous and nonferrous metal is recovered for recycling, and a program for recycling the ash is currently being finalized. The facility's pre-processing system uses magnets to pull metals from the waste stream and eddy current separators extract non-ferrous metals from the ash, diverting approximately 18,000 tons of ferrous metals (tin cans) and 2,500 tons of non-ferrous metals (aluminum cans) to recycling annually. Recycling is just one way to reduce wastes. To be really effective, we have to incorporate the 5 Rs Reduce, Reuse, Recycle, Recover and Rethink into our daily routine. Reducing the amount of waste we produce is by far the most effective way to battle the flow of garbage into the landfill. Packaging makes up about half our garbage by volume, one-third by weight. when you shop, try to find products that have little or no packaging. What we cannot Reduce we should try to Reuse. repair you old radio rather than buying a new one. use jars, tins, and plastic containers to store leftovers, bulk foods and household items. buy durable, good quality products that will last. Materials and packaging that cannot be reused should be recycled at home, work and school. You can contribute to recycling by purchasing recycled and recyclable products. at the store, ask yourself these questions: can this product or its packaging be reused or recycled? Was it produced form recycled materials? Whenever possible, choose products that meet these criteria. Recover energy from wastes that cannot be used for something else. This fourth R is difficult to put into practice by individuals, and is geared more toward industry. Rethink the problem by relooking at its source. Change habits and expectations. Look to other countries for different approaches to respecting the earth and biodegradable approaches to containers, and use of local sources for goods and services. Let's use foresight to look ahead. Do we really want to use up all the world's non-renewable resources? That would be short sighted and selfish. Think of animals, and the generations ahead. Let's apply our abilities to think and rethink about resource flow! Got and idea? share it! Live on the earth? Care for it! There are many things you can do to reduce the amount of waste you produce. Avoid food packaged in individual servings. Buy in bulk. It saves money and the environment. Buy multi-use items rather than single-use when possible. Use your own cloths bags for shopping. Donate your old clothes to charity. Buy beverages in refillable containers. Share your newspaper, magazines and books with a friend. Wrap presents in reusable cloth bags or reused wrapping paper. Rent items you use infrequently. Pack your lunch in reusable containers. Support your community's recycling programs. Buy products that contain recycled materials. Use both sides of every sheet of paper. Use a durable refillable mug or glass at school or work. Encourage your friends and family to follow your good example. Fact: If we all work at reducing our own wastes, together we will make a BIG difference. Be creative. There are many more ways we can reduce the wastes we produce.